What's the cause of flat feet? Is this podiatric condition something to be concerned about? At Coastal Foot & Ankle Associates in Houston, TX, Dr. Mark Moss is an expert in flat feet and how to correct them. He and his associate, Dr. Hina Hassan, can help you resolve the discomforts of this common problem so you can be pain-free and fully functional. Basically, a flat foot has no appreciable arch between the heel and the toes. Noticeable as a person walks barefoot, a flat foot contacts the ground over its entire surface. The official name for the gait (or way a flat-footed person walks) is overpronation, and this condition often leads to other foot and ankle problems such as painful plantar fasciitis. 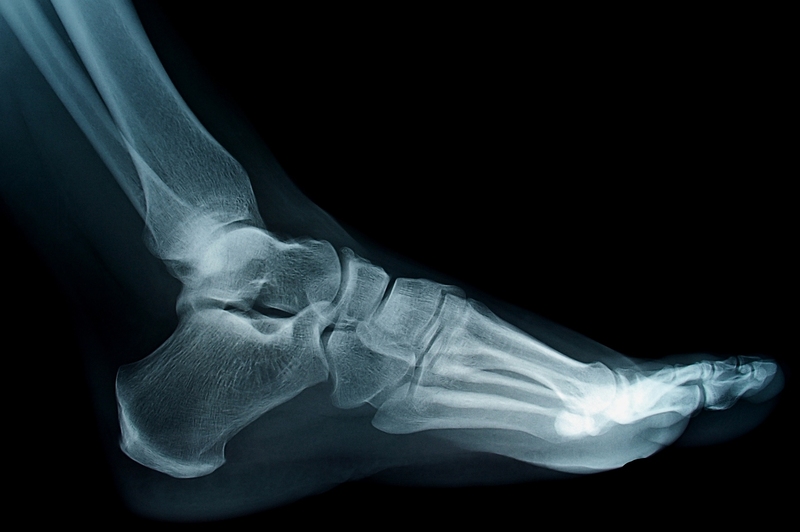 Upon visual examination, gait analysis and X-ray imaging (as needed), Dr. Moss can diagnose flat feet definitively and compose a treatment plan to prevent further damage and to lessen symptoms. Well-fitting shoes and stretching exercises often help flat feet acquired as an adult. Customized shoe inserts or ankle braces also stabilize foot structure and balance. Rest, ice, and elevation of the feet above heart level reduce inflammation and pain as do over-the-counter medications such as acetaminophen or ibuprofen. Finally, Dr. Moss may recommend reconstructive surgery for patients whose foot function does not improve with more conservative interventions. A bone fracture or torn ligament or tendon in the foot may need surgery, immobilization and rehabilitation to obtain a successful result. Flat feet are no joke. At Coastal Foot & Ankle Associates, Dr. Mark Moss sees many patients with this problem and set them on a path to optimal podiatric wellness. They'd love to help you. Please call one of our two convenient offices for a consultation. In Pearland, TX, phone (281) 485-2988, and in Houston, TX, please call (281) 484-2400. Are you dealing with heel pain? It’s time to figure out what’s going on. Heel pain is one of the most complaints our Houston, TX, podiatrist Dr. Mark Moss treats. Our heels take a lot of abuse every day, whether you are walking around in high heels or you are pounding the pavement getting in that daily run before work. So, we know that some people aren’t too surprised to find their heels protesting. What could be going on to cause your pain and when should you turn to a medical professional for treatment? First and foremost, it’s important to understand what’s causing your heel pain. Sure, you could mask your symptoms with painkillers but it’s better to figure out what’s going on so you can treat the underlying problem rather than just your symptoms. This is when visiting a Houston foot doctor is the best approach, as we can provide you with a definitive diagnosis so you know how to properly treat your condition. If it’s the first time you are dealing with heel pain then it’s a good idea to turn to a medical professional for an evaluation. The most common cause of heel pain is plantar fasciitis, which causes inflammation within the thick band of muscle that runs the length of the soles of your feet (known as the plantar fascia). Another cause of heel pain is Achilles tendonitis, another inflammatory condition that affects the Achilles tendon, resulting in pain above the heel. It’s important to visit your Houston podiatrist if heel pain is severe or sudden, if you notice severe swelling around the heel or if your heel pain makes it difficult to walk. As you might imagine, certain conditions such as arthritis or a fracture will be treated differently. Severe fractures may require a protective boot, crutches or surgery. Arthritis cannot be cured but symptoms can be managed with the proper medication. If your heel pain isn’t responding to at-home care, or if your symptoms are severe then it’s time to put your trust in our Houston podiatry team. Call our office today and let us know that you are dealing with heel pain. Coastal Foot & Ankle Associates wants to help you get back on your feet. We have offices in Pearland and Houston, TX. By What Bunion Treatment is Right for Me? A bunion is a progressive foot deformity that often affects the joint at the base of the big toe. As the bunion gets worse from putting daily pressure on the joint when walking or wearing poorly fitted shoes, it can even cause the big toe to lean in on the other toes while also causing the joint to jut out further than normal. As you might imagine, a bunion can cause pain, stiffness and other issues for the sufferer but our Pearland and Houston, TX podiatrist Dr. Mark Moss is here to tell you what you can do to treat your bunion effectively. While all these measures will not realign the big toe what it can do is take pressure off the joint to reduce your chances of experiencing foot pain, inflammation or other issues. When people hear that the only way to truly correct this deformity is through surgery many people wonder if they should just get surgery. If you are experiencing persistent and extreme pain that is affecting your daily life and activities, or if your symptoms cannot be managed through more conservative care, surgery should be considered. Do you think you are dealing with a bunion? Wondering whether it’s time to consider bunion surgery? If so, our Houston podiatry team is here to provide you with the answers and care your feet deserve. Call Coastal Foot & Ankle Associates in Pearland and Houston, TX today to schedule an appointment with us. Ankle replacement surgery can alleviate ankle pain due to severe arthritis, increase mobility, and improve your quality of life. Previously, ankle fusion was the primary surgical option for alleviating ankle pain due to arthritis. One drawback to ankle fusion is that the ankle joint loses mobility since it is fused to the leg bone. Ankle replacement surgery not only alleviates ankle pain, but also improves motion in the ankle joint. At Coastal Foot and Ankle Associates, Dr. Mark Moss is your ankle surgeon for ankle replacement in Pearland and Houston, TX. Total ankle replacement, also called total ankle arthroplasty, is a surgical procedure for replacing the ankle joint much like hip and knee joints can be replaced. Ankle replacement surgery is performed when chronic arthritis of the ankle has lead to severe pain, limited mobility, and possible loss of cartilage in the ankle. During the procedure, the ankle joint is replaced with an implant composed of two metal parts separated by a spacer. The metal components replace the original ankle joint, while the spacer allows the ankle to maintain mobility. Recovery from ankle replacement surgery takes a few months. Patients typically cannot return to normal activities for at least 16 weeks following surgery. About a week after surgery, a boot or cast will be placed on the foot to aid in the recovery process. Several weeks later, physical therapy can begin and will continue for several more weeks. Ultimately, as the ankle heals, it will become stronger, mobility will increase, and pain will be gone. In Pearland and Houston, ankle replacement surgery is available at Coastal Foot and Ankle Associates. Ankle replacement could help you in several ways by eliminating ankle pain and improving mobility. To learn more about ankle replacement in Pearland and Houston, TX, schedule a consultation with Dr. Moss by calling Coastal Foot and Ankle Associates at (281) 484-2400 for the Houston office, or (281) 485-2988 for the Pearland office. Flat feet don't just cause pain in your feet but may be a contributing factor in leg or back pain. Fortunately, a visit to the foot doctor can help you manage your condition and avoid common pitfalls. Podiatrist Dr. Mark Moss cares for patients who have flat feet in his Houston and Pearland, TX, offices. Flat feet can be present at birth, although many children will eventually outgrow the condition. It may also be caused by foot injuries, weakened tendons, arthritis, or diseases or conditions that affect the muscles or nerves. What problems do flat feet cause? Foot and Ankle Pain: Pain is common on the inside of your foot and ankle if you have flat feel. You may notice that pain worsens when you play sports, exercise or walk or stand for long periods. Pain may also occur on the outside of your ankle if your heel bone moves out of position due to your arch issues. Swelling or Numbness: You may notice that ankle swelling accompanies pain. Numbness or weakness in the feet can also occur. Ankle Injuries: Flat arches cause your feet to pronate, or turn inward, which may make it easier to twist or sprain your ankle. Hip, Knee or Back Pain: Your back, hips or knees can become painfully misaligned due to your flat feet. What can I do about flat feet? A visit to your Houston or Pearland, TX, podiatrist can improve your comfort. After an examination of your feet and a gait analysis, your foot doctor may recommend prescription shoe inserts called orthotics or orthopedic shoes. Both of these options will keep your feet and ankles properly aligned and reduce your symptoms. Physical therapy may also be recommended to strengthen the muscles in your feet and legs. If orthotics and physical therapy aren't helpful, surgery may be recommended in some cases. Find relief for your flat feet symptoms with podiatric treatment. Schedule an appointment with Dr. Mark Moss by calling (281) 484-2400 for the Houston, TX, office or (281) 485-2988 for the Pearland, TX, office.